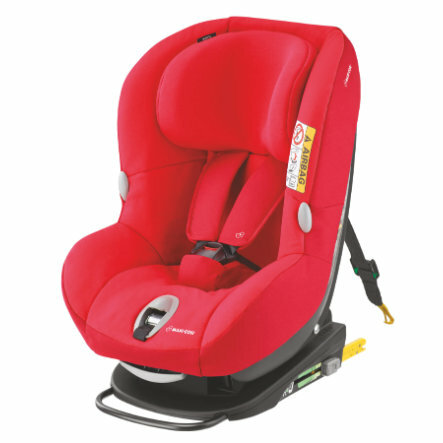 The MAXI-COSI® MiloFix is the new, rotatable Isofix car seat, which can be used from birth to approx. 4 years. It is first used as a rearward facing baby car seat from birth to approx. 15 to 18 months and is then turned forward for use as a toddler car seat. The MiloFix easily adapts to the growth of your little one, because the headrest and the harness can be adjusted simultaneously and very easily. No matter in which direction you use the seat, Isofix installation provides optimum protection for your child and the self-explanatory installation guarantees that the seat is and remains correctly fastened. The installation with Isofix and Top Tether and a colour indicator guarantees correct fastening and optimum safety. Please note: Do not use on seats equipped with front airbags!